Today is day 8 of our Million Dollar Highway motorcycle ride. Today we realize our dream to ride the Million Dollar Highway. This was a pretty easy day and the best day of the trip because of the route. This was the purpose of the trip. LC had read something about this route on the inter-net and suggested it when we initially talked about making this trip. I was not sure the weather would let us riding this route because of the altitude and the time of the year but as it turned out it was the best part of the trip. LC said it was the best ride he had ever ridden. We got an early start and the temperature in Cortez was 49 degrees. We knew it would get colder as we climbed in altitude. The coldest it got was 34 degrees according to the air temperature reading on my bike. I’m not sure what the highest altitude we reached but I know it was over 10,000 feet. The bikes performed flawlessly in the mountains. In fact we got our best gas mileage on this leg of the trip. I got over 52 mpg and LC and LT got similar gas mileage. At several of our stops at higher altitude we could tell we were not at sea level. We wouldn’t be running any races up the mountain. I just loved the mountain towns on this route. 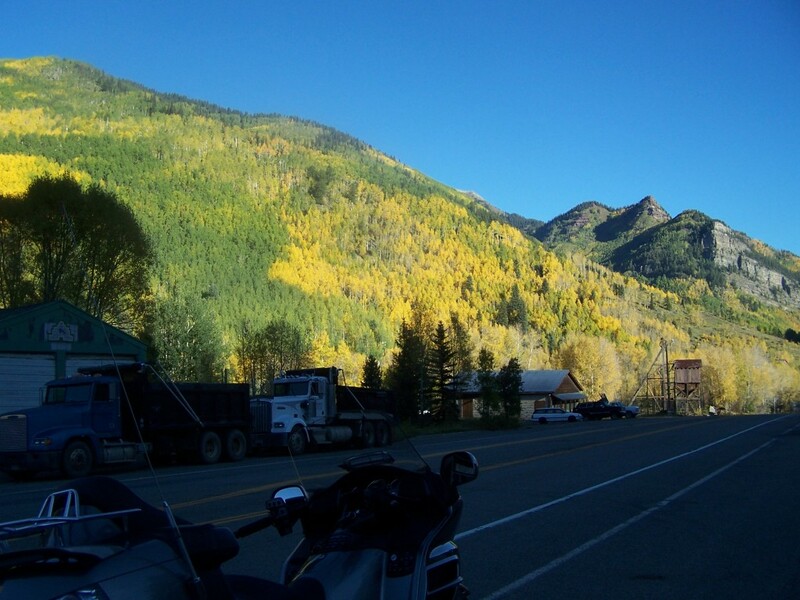 Ouray looked like something you would see on a post card or calendar. 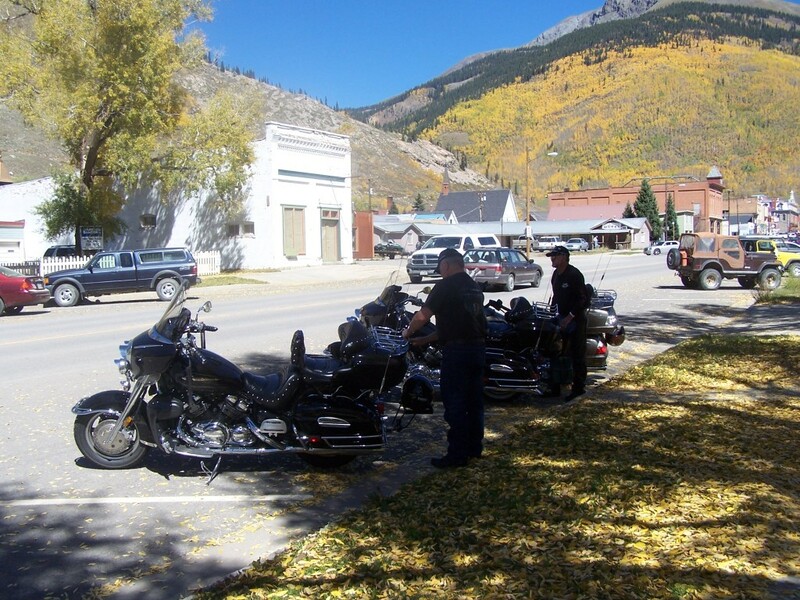 I thought we would stop for lunch there but since it was still early and no one was hungry we rode on to Silverton. 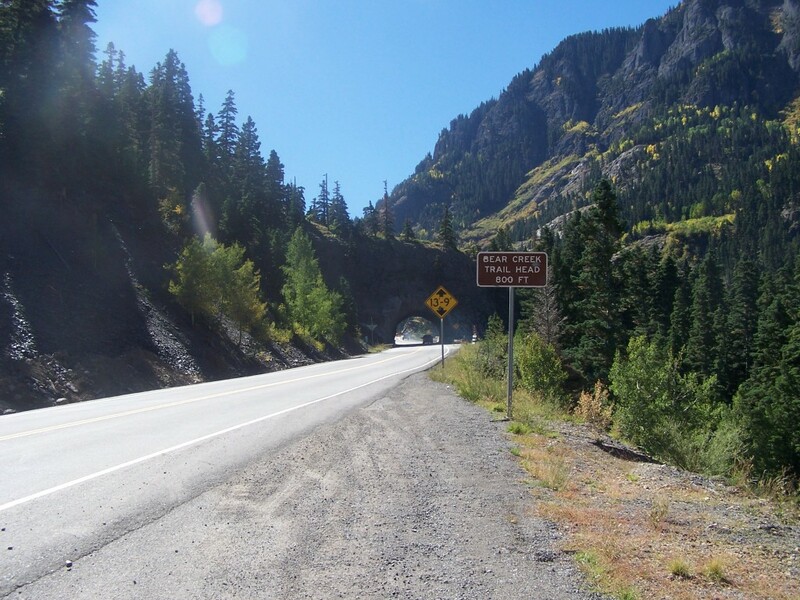 The Million Dollar Highway stretches for about 25 miles in western Colorado and follows the route of U.S. 550 between Ouray and Silverton. The origin of the name Million Dollar Highway is disputed. There are several legends, though, including that it cost a million dollars a mile to build in the 1920s, and that its fill dirt has a million dollars in gold ore.
Once on the Million Dollar Highway we rode through a series of steep grades and hairpin curves without guard rails. Not for the faint at heart, particularly on a motorcycle. 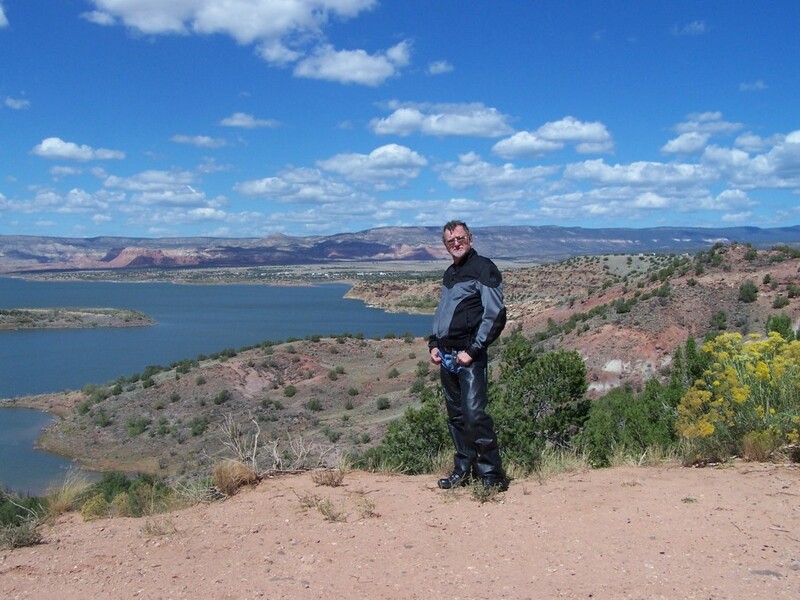 This is what motorcycle riding is all about… It doesn’t get any better than this. 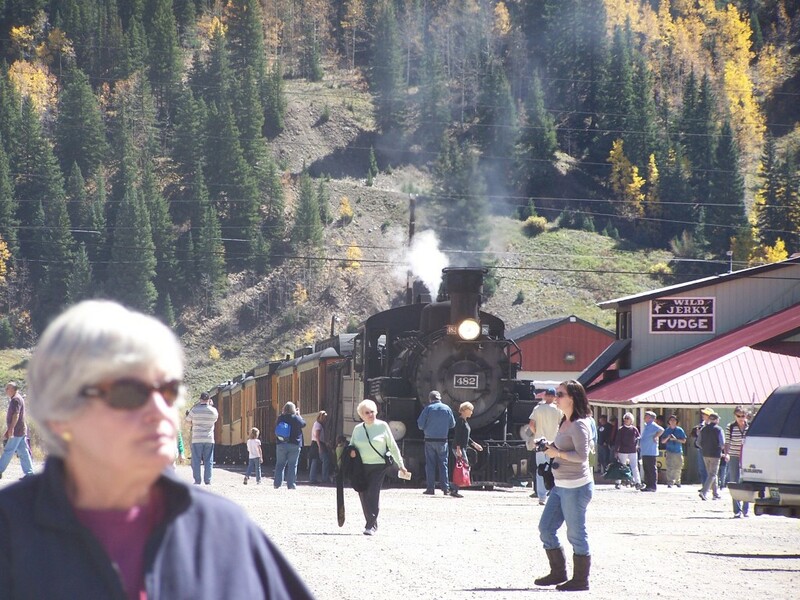 Silverton, as one local puts it, “Silverton: A gritty little mining town with Victorian pretensions!” Once the stomping ground of silver kings and railroad giants, Silverton survives today as one of Colorado’s most endearing destinations. When we arrived there were tourist everywhere, no lack of people spending money. There are lots of shops for tourist to spend money. We ate lunch at the “Thee Pigs, Again”. I had a BBQ brisket sandwich with potato salad and BBQ beans. It was as good as anything I could get in Texas where beef is the king of BBQ. After lunch we walked around town. There are only two streets that parallel each other, the main street being paved and the other being gravel. 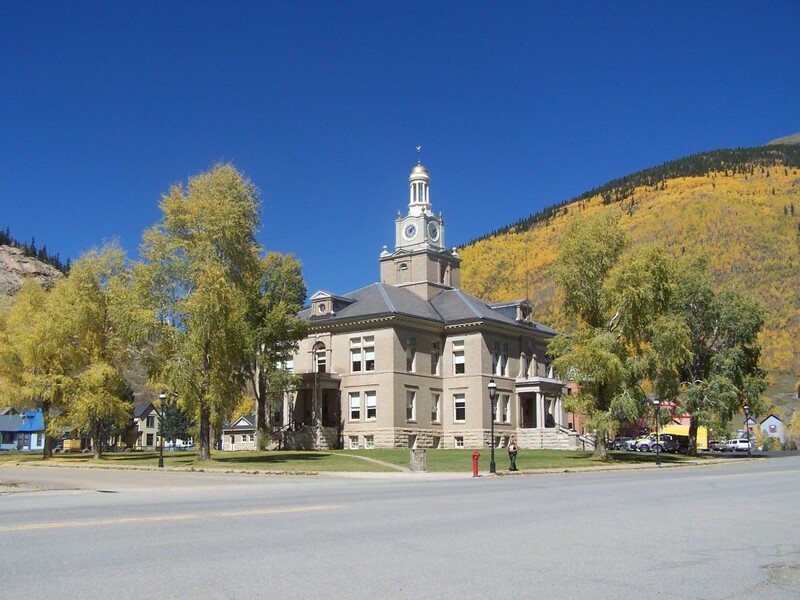 Words and pictures won’t do justice to describe Silverton. It can only be experienced. From there it was back to Cortez. 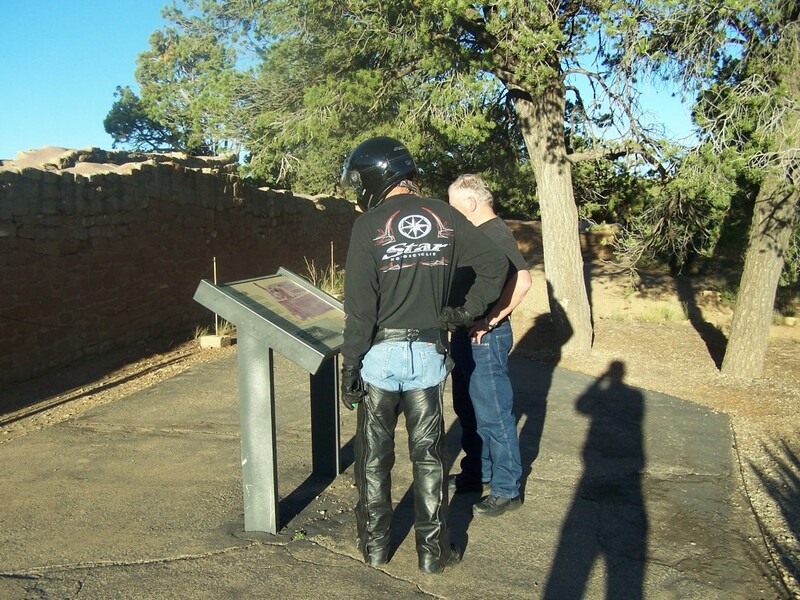 I wasn’t sure if we would have time to make a quick pass through Mesa Verde but after discussing it over the radio we decided to give it a shot. I had been there before but that was about 18 years ago. When we got to the gate we found out that it was a free day at all the National Parks. We stopped at the visitor center and talked to one of the rangers who suggested places to visit in the park since we had such limited time. In spite of the time we did get to see quite a bit. 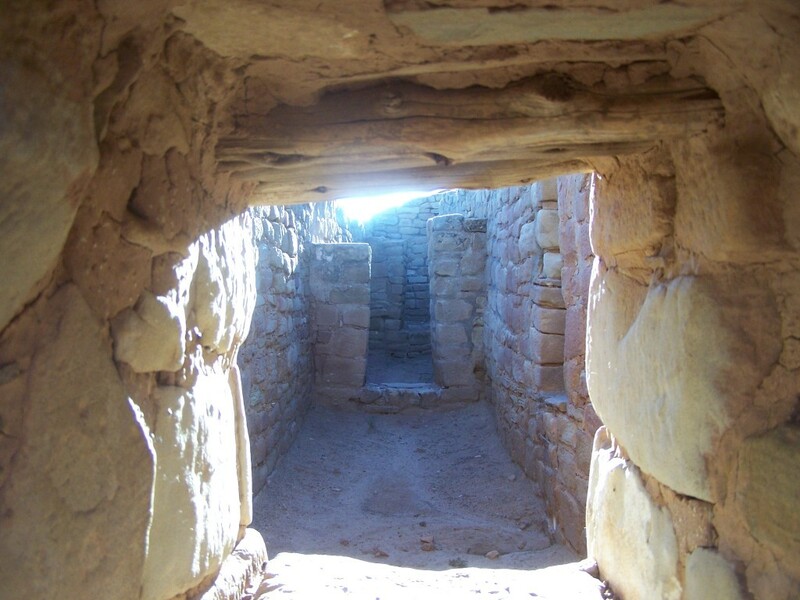 We didn’t get to take any tours but were able to view a goodly number of the cliff dwellings from afar and several ruins up close. The ride into and out of Mesa Verde is spectacular. 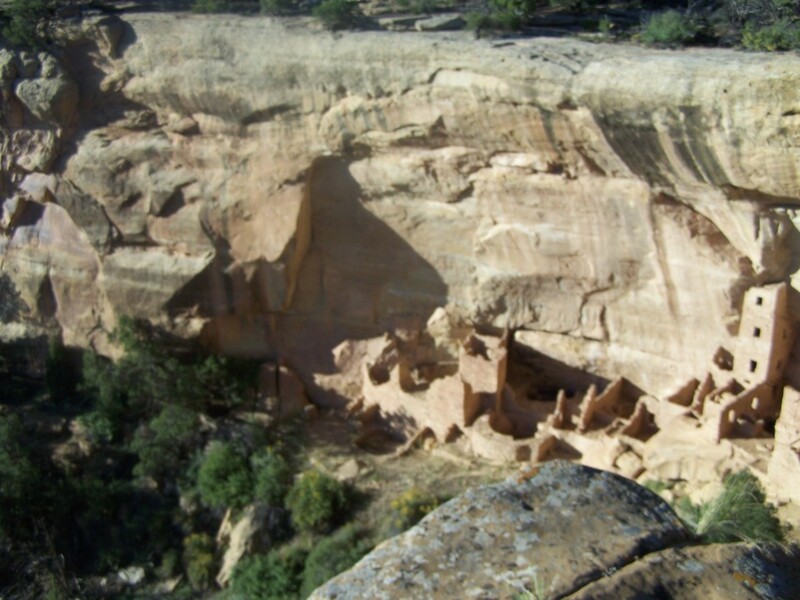 It is 15 miles from the entrance gate to the visitor center on top of the mesa. The ride to the top takes you through many curves, switchbacks and hairpin curves. The views were spectacular. On the way out we saw several deer, which the ranger warned us about. We definitely didn’t want to see them up close and personal. The other hazard we encountered was the sun. It was starting to set and as we came around some of the curves we went from shadows to bright sun light in our eyes, which made it difficult to see some of the curves. Once out of the park we were riding west into the sun and that was nerve-racking because of the lack of visibility. We did manage to make it back safe and sound. We have reached and rode our goal for this trip… The Million Dollar Highway. It was everything we expected and much more. Another ride to check off our ride bucket list. If you have a chance to do this ride by all means take the opportunity. You won’t regret it. As always there were many things to do that we didn’t have time for so I hope we can do this ride again. Today is day 7 of our Million Dollar Highway motorcycle ride. Originally the day was to be a relatively easy day of riding just 115 miles to Cortez, CO via 4 corners but as we were rolling through Farming, NM, LC was listening to a local radio station when they mentioned something about Monument Valley. LC asked me how far it was. I told him I wasn’t sure of the distance. 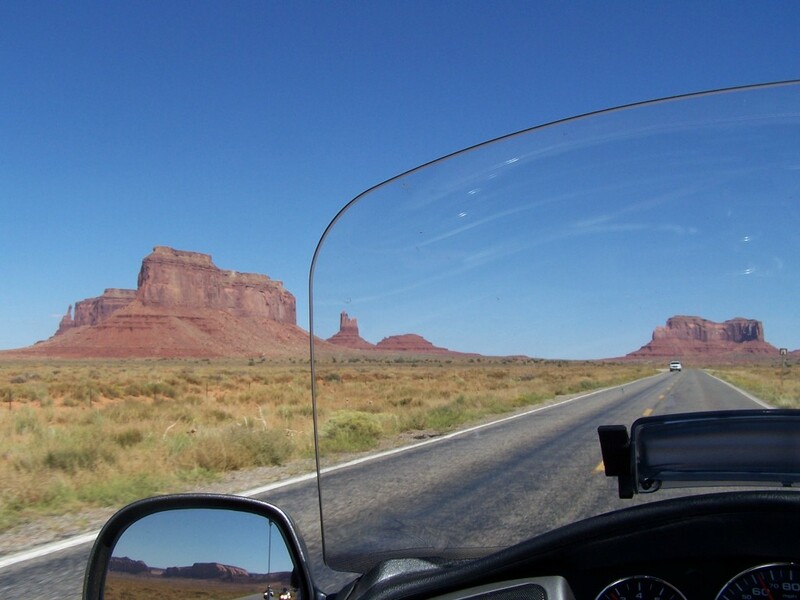 When we stopped at 4 corners I checked the map and GPS and found it would be 281 more miles to ride through Monument Valley. Since it was still early and who knows when we might get back to ride through Monument Valley we decided to change our route and ride it. We ended up spending more time at 4 Corners because several people stopped us to ask about our trip. One was a biker but was traveling in a car that day and another was riding his Voyager. LC and LT ride Voyagers so the had to talk shop with him. We back tracked about 10 miles and headed to Kayenta, AZ where we ate lunch at Burger King, looked at an Indian village replica on the lot next to Burger King. 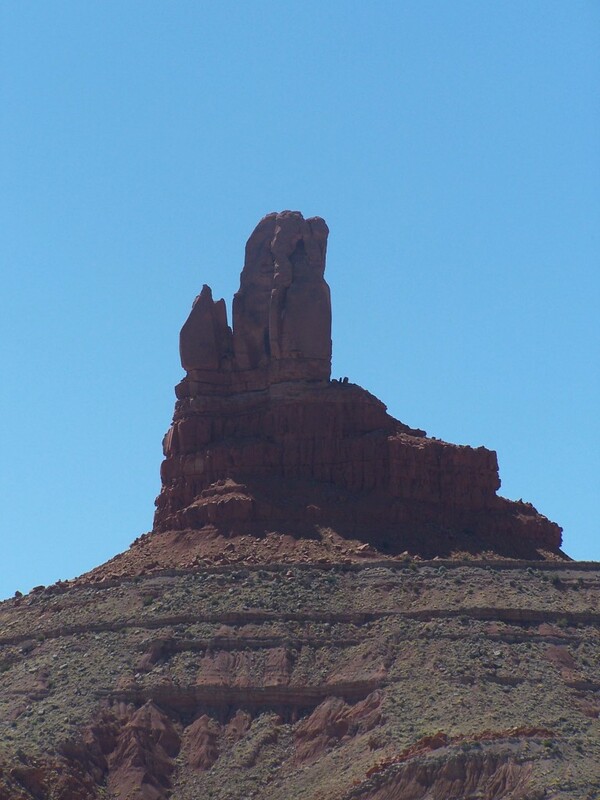 From there it was on to Monument valley. We should have stopped at one of the movie sets where John Wayne filmed one of his movies but somehow we failed to communicate and rode on. It made for a longer day but it was all good. Today is day 6 of our Million Dollar Highway Motorcycle ride. We were up early, it was still raining pretty hard and the temperature was in the 50’s. We had breakfast and loaded up the bikes put on our rain suits and headed out. The further north we got the more the skies got clearer. 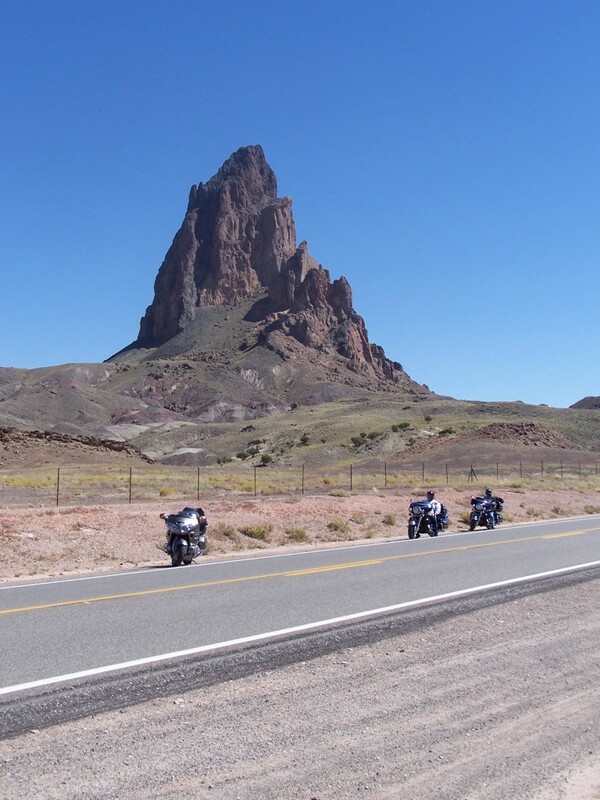 By the time we got to Santa Rosa, NM (45 miles away) we had clear skies and it was another beautiful day for riding. The ride to Santa Fé was a very nice one. Of all the cities in New Mexico, Santa Fé is one of the best. 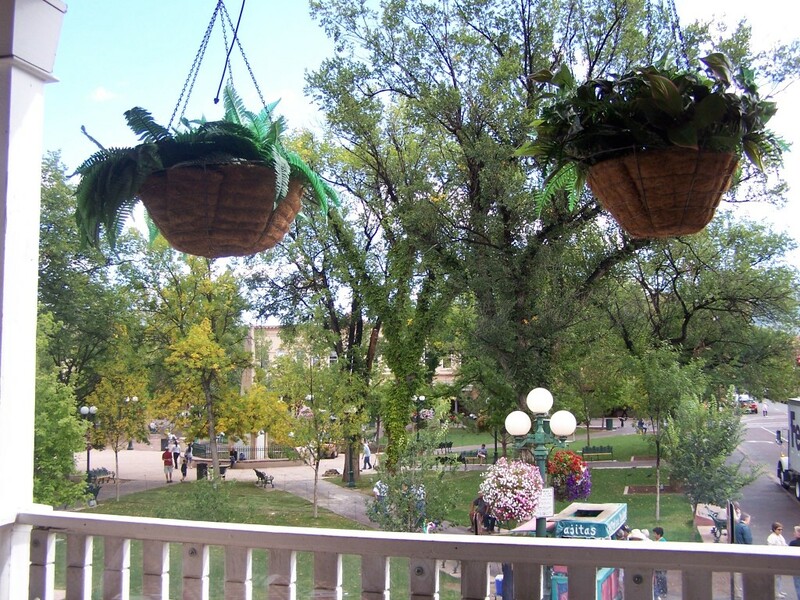 Santa Fé has tried to keep the pueblo look from its pueblo Indian origins. It is a unique place with a very unique feel. There were a lot more people in Santa Fé than I had expected for September. The parking lot I had planed on parking at was full but we got lucky and parked on the street in one metered parking slot. 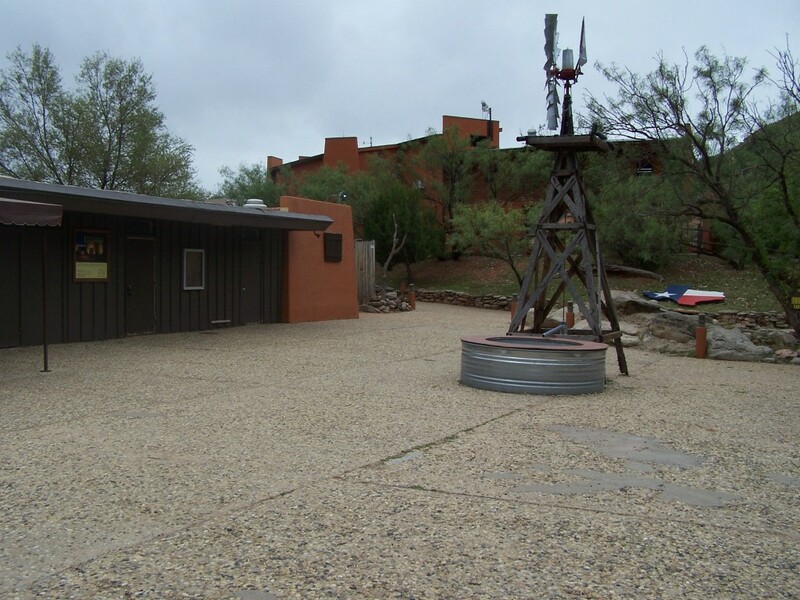 I wanted to park there because it was near the Loretto Chapel where the “Miraculous Staircase” was. After getting a map of the downtown we made our way to see the staircase. 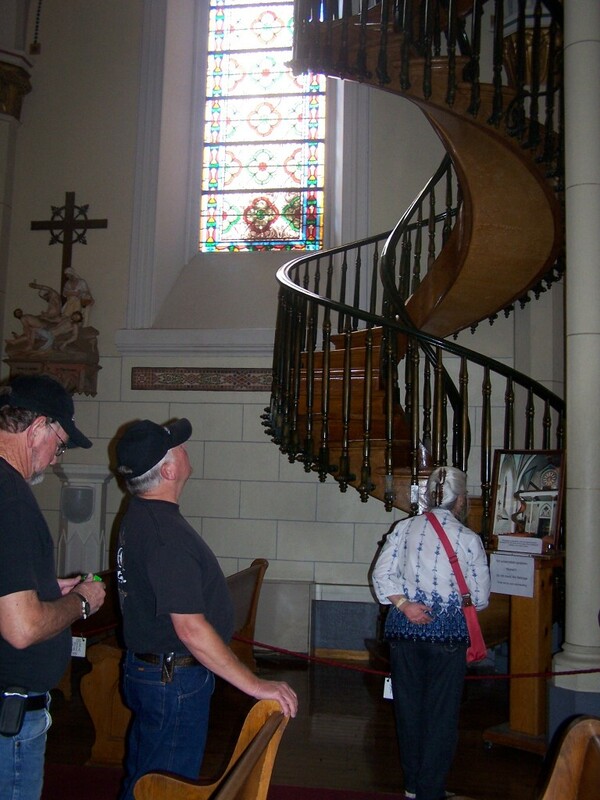 Two mysteries surround the spiral staircase in the Loretto Chapel: the identity of its builder and the physics of its construction. The staircase has two 360-degree turns and no visible means of support. Also, it is said the staircase was built without nails—only wooden pegs. Questions also surround the number of stair risers relative to the height of the choir loft and about the types of wood and other materials used in the stairway’s construction. 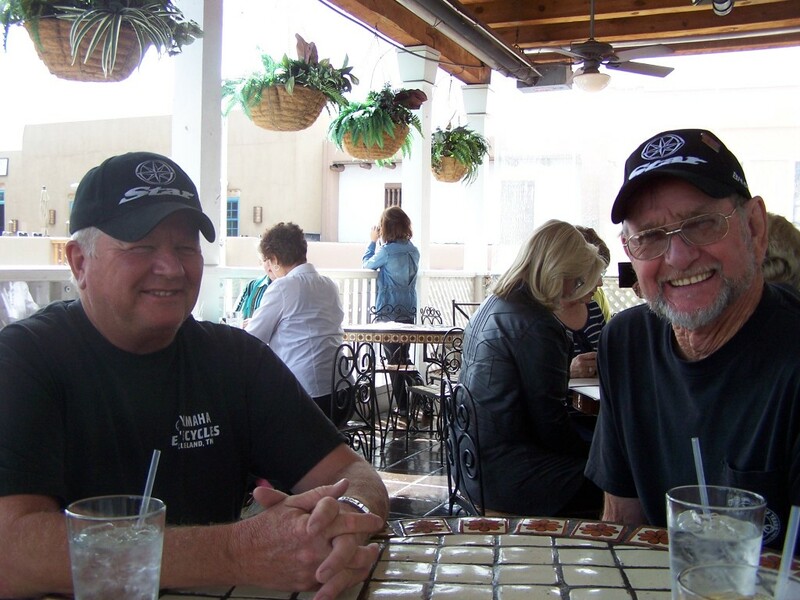 We walked to the downtown square and had lunch at the Ore House Tequila & Gift Shop. The restaurant is upstairs and we ate on the balcony where we had a good view of the square and all the happening there. The trees on the square were starting to turn color from the cooler weather. Janet and I had eaten here before and I made a point not to order the chipolte burger. Mucho caliente… so I opted for the green chili stew, which was more like a soup. It was very good but it too was really hot… hotter than what I was used to, but not as bad as the chipolte burger I had before. Parking was so hard to find that when we left someone waited for us to get mounted and leave. 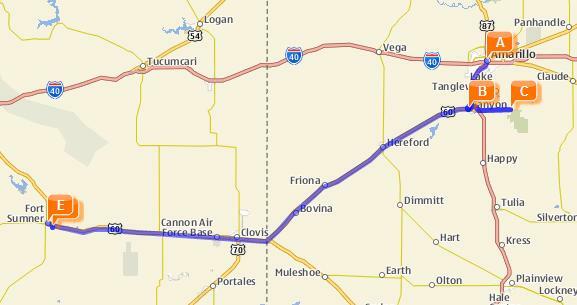 LC & LT told them it would be a while because I had to enter the route of our next leg of the trip into the GPS. They opted to wait causing a bit of a traffic jam. 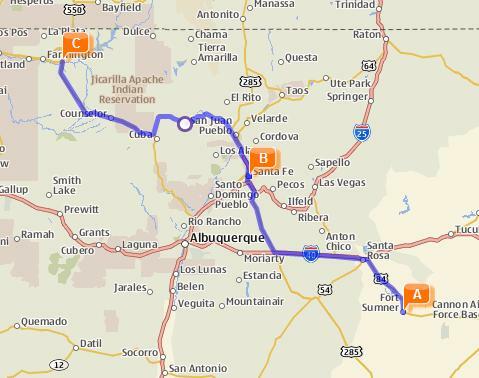 We headed for Cuba, NM. The scenery was nice along the way. We had intended on staying the night but because we were making such good time we decided to ride on to Bloomfield, NM instead. 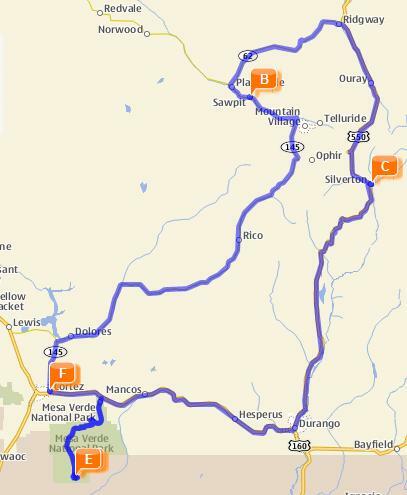 It did make for a longer ride (88 miles) but would make for a short easy ride to Cortez the next day. About 5 miles out from Bloomfield as per the GPS I radioed the others the distance. LT later told me he was about to key the mike to tell me that he was ready to stop at the next town. 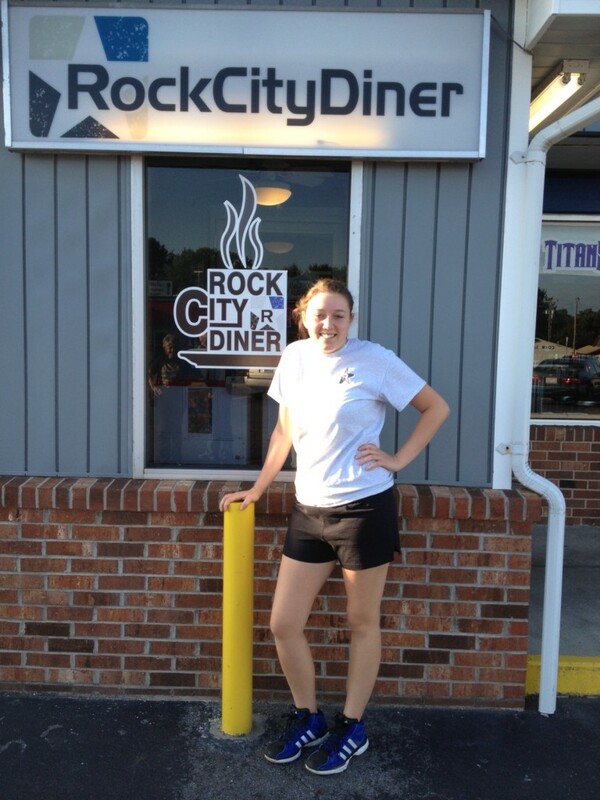 We ate at a little restaurant across the street for supper. It was good and really cheap so we opted to eat breakfast there the next morning. We were a little tired of the continental breakfast we had got at the motels. Some of the continental breakfasts are OK for the most part but some were pretty lacking too, but they were included with the rooms. 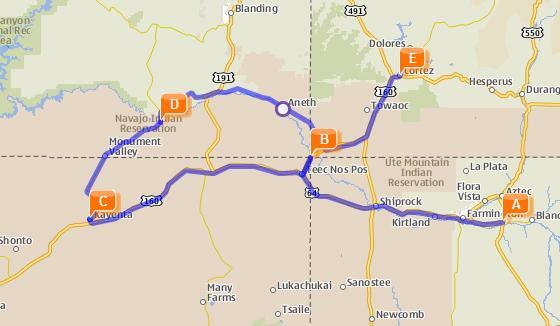 Tomorrow we ride to “4 Corners” on to Kayenta, AZ through The Monument Valley on to Cortez, CO for 298 miles. Come follow a long and enjoy the ride and scenery with us. LT & LC at the Palo Duro Canyon visitor center. Today is day 5 of our Million Dollar Highway Motorcycle Ride. 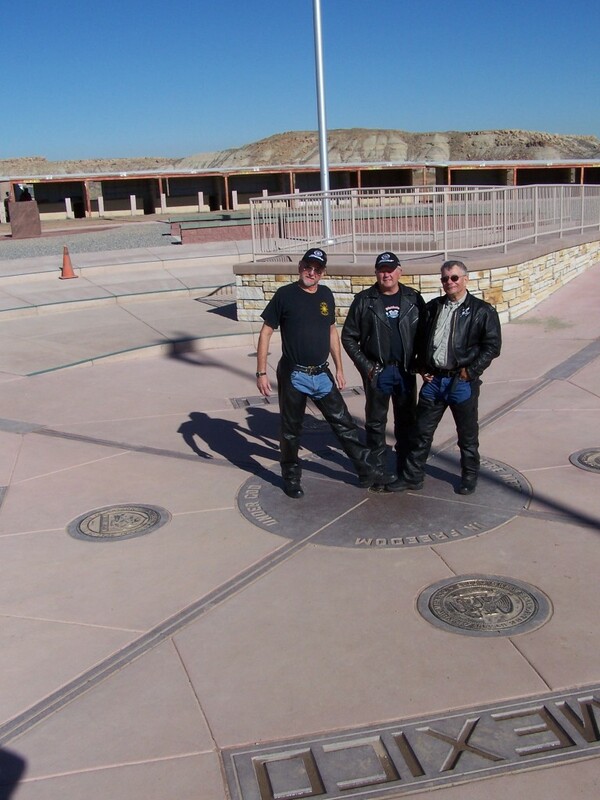 We rode from Amarillo to Canyon and rode through the Palo Duro Canyon. As always the Palo Duro was spectacular as usual. 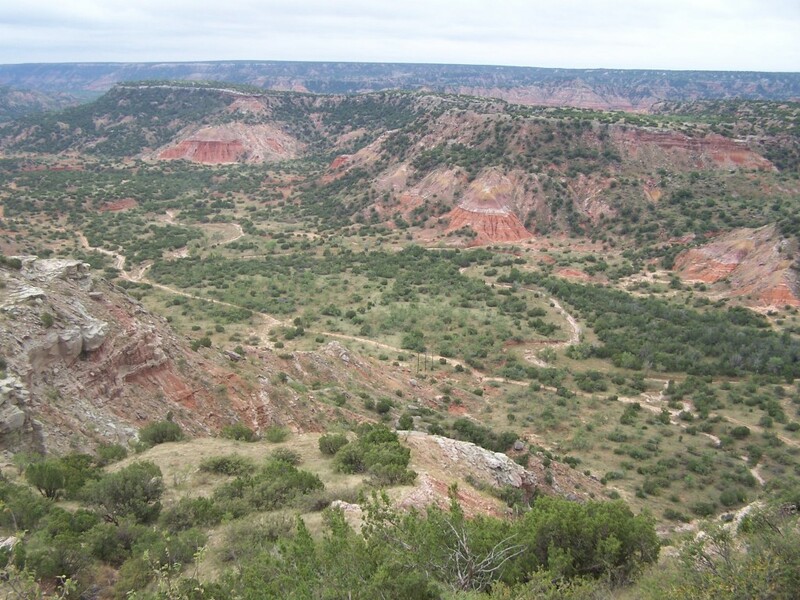 LT said, Shirley (LT’s wife) liked Palo Duro (previous trip) the best of all the places we had ridden in Texas. 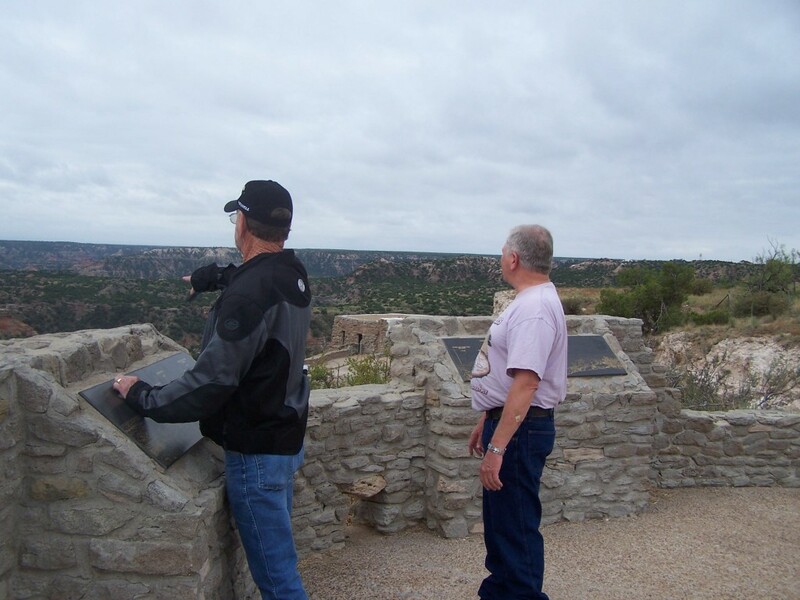 We didn’t spend a lot of time in Palo Duro, it was misting rain and we didn’t want to get stuck there. We ate lunch at the little restaurant in the park and then headed on out of the park. 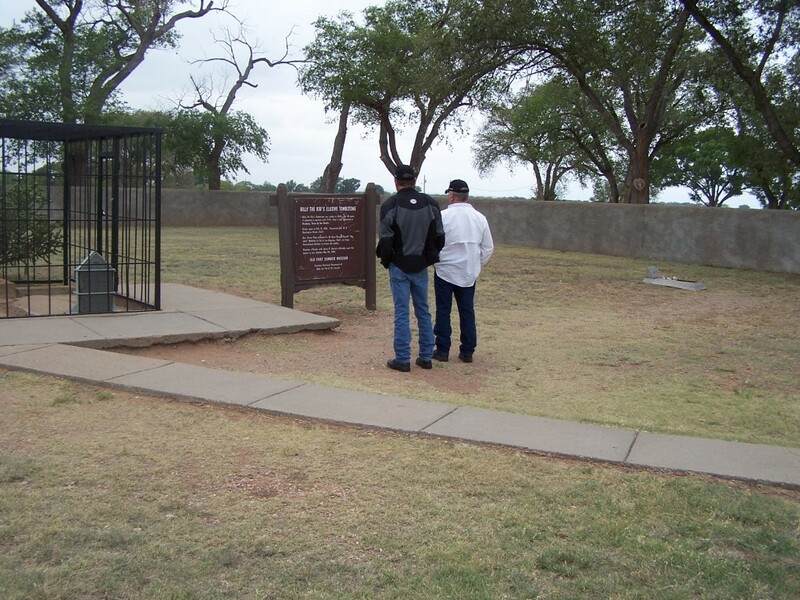 Since we were making such good time we decided to ride on to Ft. Sumner, NM where Billy the Kid is buried and maybe we would ride as far as Santa Rosa, NM. Riding to Ft. Sumner we rode in the wind again but it wasn’t blowing as hard today. It was misting rain but it wasn’t enough for us to stop and put on the rain suits. The scenery, between Canyon and Ft. Sumner, was for the most part flat ranch and farmland. We toured the museum at the site of old Ft. Sumner where Billy’s grave is. It was interesting to explore all the history and controversy surrounding Billy. Billy didn’t get much rest even after his death. When we left the old Ft. Sumner on our way to the town of Ft. Sumner it started to rain harder. We had considered riding on to Santa Rosa 45 miles away but decided to stay in the town of Ft. Sumner and tour the Billy the Kid Museum there also. It was probably a good decision, because by the time we got checked into the motel it was raining pretty hard. After checking in and getting settled we walked to the museum just down the street a ways in the rain. It was larger than the museum at the old fort and had all sorts of historical displays. We visited with the owner of the museum before leaving. His father started the museum back in the 50’s. He was a biker too and bikers always enjoy talking to other bikers. It was raining pretty hard by the time we left to walk across and down the street to the restaurant were we ate. The Museum owner gave us garbage bags for ponchos so we wouldn’t get drenched. We made our way to the restaurant in the rain. It was a good thing we had the garbage bag ponchos, the water was running pretty deep in several spots and we had to dodge the big trucks to avoid being splashed. We had some good Mexican food. I love small towns and all the little locally owned restaurants and this was another one worth noting. Then it was back to the motel in the rain and getting ready for the next day.